Bangladesh is under state of Emergency. Proclamation of Emergency: If the President is satisfied that a grave emergency exists in which the security or economic life of Bangladesh, or any part thereof, is threatened by war or external aggression or internal disturbance, he may issue a Proclamation of Emergency. Chief of Bangladesh Army, General Moeen U Ahmed accompanies his wife to a six day trip to neighboring India. On arriving in New Delhi, he receives red carpet welcome. He stays at Taz palace hotel and attends a gala dinner hosted by Indian army chief. The following morning he receives gift of six horses from his Indian counter part. These six horses are supposed to be transported to Dhaka, mate, breed and are planned to be used for equestrian sports by the members of Bangladesh armed forces. Same night he attends another grand gala dinner hosted by Bangladesh high Commission and attended by Indian politicians. General Moeen and his wife then traveled to Ajmeer Sharif and offered prayer at the Majar Sharif. They also did some sightseeing tour of famous Taz Mahal. After spiritual treat at Ajmeer and visual treat at Taz Mahal, General and Mrs Moeen were flown to India’s famous Goa beach resort city. There they indulge themselves on the beautiful Arabian sea beach at Panaji, Goa. The General and his wife then flew to West Bengal, Kolkata. In West Bengal General Moeen’s major planned stops were meeting local politicians, visiting Jorashakor Thakur Bari (the home of poet Tagore), Shanti Niketan (an art-literature university established by Tagore), attending dinner hosted by Indian eastern command general and supervise the construction of metal cage along the India-Bangladesh railroad. And all these days, Bangladesh, the country General Moeen is supposed to protect (From both external and internal calamities), remains under a state of emergency. This New Age Editorial sums up the major concerns very well. Although I understand New Age’s concern and feeling of humiliation at this governments spineless giving in to all the Indian conditions before a train communication can start, I do not share the humiliation much. I feel the benefits are worth this tiny bit of humiliation. India’s BSF is killing Bangladeshi citizens day in day out. Nobody is too much bothered or humiliated about it. Have BDR shoot a BSF jawan or Indian citizen, you will see how the hell ( AKA Indian press) break lose on us. I, however, feel more humiliated at the arrogance and blatant disregard of the public by a bunch of military officials belonging to Bangladesh armed forces. Just go pick up the top leaders of the country, each enjoying the respect and recognition as the leader of almost 50% of the population; throw them in the jail and keep them behind bar for an indefinite period without any charges! Total impunity, total lack of accountability, total recklessness!! How a bunch of paid professional soldiers, who are fed, clothed, accomodated, educated, armed, rested by the peoples’ money, can torture the leaders of the people so inhumanly? Who gives them the right or the courage or the guts to torture the son of one such leaderby hanging him from the celing? 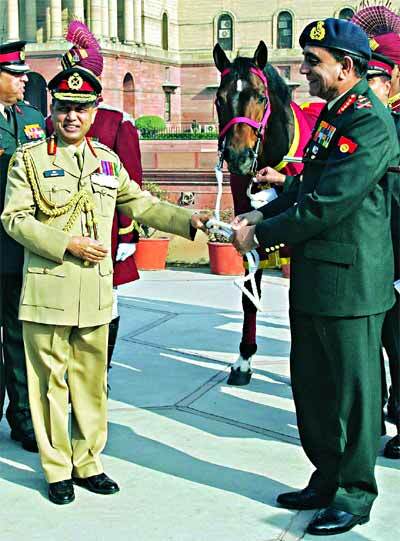 The following editorial discusses the questions raised the Army Chief’s India visit. Lets not be redundant. But I want to take this opportunity to remind the readers about what India did after the gruesome killings of 15th August and Jail killing of 3rd November. They did nothing ( Not asking for a rebuke/invasion, what about a condemnation or concern at all the killings?). They simply remained silent about the unfolding of events and was eager to extend their cooperation to the successive new regimes, starting with that of Mustaque/Faruq gong. While they remained totally silent after 1/11 suspension of democracy, recently India’s high commissioner to Bangladesh is acting like the ” Master Moshai” to all the Bangladeshis! Once a while I wonder whether India really wants a progressive, secular, economically strong and stable democracy on its east border or they want another rogue failing Islamic state with a strong branding as a hub of terrorism. Who does not want to be the only good kid in the block? The unelected government of Fakhruddin Ahmed has visibly swallowed the Indian proposal of constructing a ‘security cage’ on both sides of the border to resume direct passenger train service between Dhaka and Kolkata – a humiliating proposal that the previous government had refused to accept. The people of Bangladesh have always been in favour of maintaining close contact with the people of India, with whom they share common history and culture in many areas, and therefore welcome the perceived train services. The people of Bangladesh, however, rightly felt uncomfortable with the Indian idea of passing the trains through a ‘box-type’ cage to be constructed on the ‘no man’s land, which, the Indian negotiators believe, would deter illegal immigration, if there is any. Bangladesh had, therefore, rightly been refusing to entertain the humiliating proposal. Subsequently, the agreement of the direct train service, initiated in July 2001 and almost finalised in July 2007, did not materialise. Suddenly, Fakhruddin’s cabinet approved the Indian proposal on Monday! Notably, India has direct train services with its arch rival Pakistan, but the trains do not pass through any cages. What, however, is especially noteworthy is that the cabinet approval of the Indian proposal came the day General Moeen U Ahmed, chief of our armed forces, which propelled Fakhruddin to power, began his extraordinary visit to New Delhi, the capital of India. The visit appears extraordinary because the general, who is believed to have been the prime backer of the otherwise unpopular government of Fakhruddin Ahmed, is scheduled to hold talks with a couple of Indian cabinet members including foreign minister Pranab Mukharjee, and also the chief minister of the Indian state of West Bengal, Buddhadev Bhattacharya. This is alarming. In ordinary visits, our general is not supposed to have official talks with foreign politicians, particularly when the two countries involved have quite a good number of disputed issues to be resolved through political negotiations. That the visit is an extraordinary one is also reflected in the political enthusiasm of the Indian High Commissioner in Dhaka, who had reportedly visited prior to the general’s departure for Delhi, Khandaker Delwar Hossain, the secretary general of the Bangladesh Nationalist Party and Zillur Rahman, the acting president of the Awami League. None of the parties involved clearly told our people as to what transpired in those meetings, creating a lot of concerns in the public mind as regards what issues would come up during general Moeen’s discussions with Indian policy makers. The concern has further deepened after our government’s approval of the Indian proposal to construct the controversial security cage on no man’s land immediately before the visit. Are the unelected incumbents passing any message to the Indian political establishment? We do not know. However, what we know is that the hegemonic powers, regional or global, usually like weak governments in the neighbourhood as the hegemon finds it easy to settle disputed issues with the weak to the former’s advantage. And the weakest government is the one which is not elected by the people, as is the case in Bangladesh today. The weak governments, if ambitious to cling to power without people’s mandate for long, usually seek cooperation of the hegemonic powers, and at times they succeed in it, albeit at the cost of national interests. We only hope that general Moeen’s extraordinary visit to Delhi would not cost us very dearly, and expect that he upon his return would apprise us all, at the least, of what issues he discussed with Indian leaders, and what are the possible implications of those discussions for our people. I can make an easy assumption here. If one does a quick poll on how many people knew of film star Manna, I am pretty sure, 90% would have answered they never heard of Manna. And I am pretty sure the numbers would have been respectively 99% and 100% negative if the questions were how many saw a Manna film and how many of them were Manna’s fans. 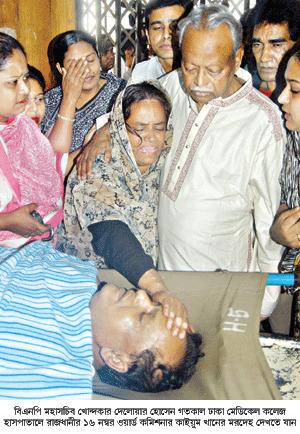 On February 17, Dhaka film star Manna died of heart attack. For me, I heard of Manna’s name as a Dhakaiya film actor but never saw any of his movies. (Even If I did, would I confess it in this forum? Mere knowing of Manna, forget about watching his film or becoming his movie, is a blatant sign of cultural backwardness and social downwardness among the members of my class). When I was watching TV footage of the crowd at United Hospital where Manna died, I thought, OMG, Manna must have been a popular hero. It was a surprise. But that surprise was nothing compared to what I saw the following day, again in TV news footage. Tens of thousands men, young and old, from all over the country, gathered in front of FDC (Dhaka version of Hollywood Film Studios); only to have a glance at Manna for the last moment. Failing to enter FDC campus, those gathered got involved in a pitched battle with the police. E-Bangladesh posted a story on this event. The body was supposed to be taken to Shahid Minar for public viewing. Another mass, tens of thousands strong, also gathered there. And more people were thronging along the way from FDC to Shahid Minar. The clash between police and the mourners got ugly. Fearing people power, the military government forced the FDC organizers to cancel the Shahid Minar viewing. The spontaneous gathering of people was remarkable. Dhaka has not seen such spontaneous gathering in many years. Even during the peak days of recent anti government movement, all the organized gatherings were not as big. The whole country used to wait for this event throughout the year. Anticipation with sheer excitement and expectation gripped the nation for days. Since morning, the line in front of Dhaka stadium ticket counters looked like a sea of humanity. The annual football face-off between Mohammedan and Abahani, the two most popular football teams in Dhaka used to be the grandest ever super bowl for impoverished Bangladesh. I still vividly recall one such evening of excitement. It is possibly a match-up 30 years ago. Incidentally it was also the evening of Shab e Barat. Saudi wahbism started flexing its muscle in Bangladesh from late seventies. Until then, Sufi influenced Milad Sharif, Shabe barat etc used to be quite a big thing in Bengali Muslim culture. Ashraful, Shahriyar, Aftabs are national sporting icons now a days. It was Nannu, Manju those days. Nannu was the captain of Abahani and his brother Manju was Mohammedans captain. I still recall being glued to BTV live telecast of the game. I still recall, under roaring applause, two brothers Nannu and Manju shaking hands and exchanging club flag. Then the classic football of Nannu, Manju, Gaffar, Kohinoor, Amalesh, Abul, Enayet etc. Every household didn’t have TV in the 70s. So each drawing room with a TV set was filled with whole neighborhood. It was fun. Thunderous cheers with every goal or missed goal, tea, biscuits coming from different households, women gossiping in the backrooms. The scenario was much more electrifying inside Dhaka stadium. As soon as the game started, a group of very excited football fans across a 30 feet high barbed wire fence separating East and West gallery, used to start throwing brickbats and verbal abuses to each other. This then inevitably would spread in the vicinity of the stadium. Football legend Nannu died today. He was 59 and was suffering from cancer and kidney failure. I had to write something on our extinct national craze, football and one of its best artists, Monwar Hossain Nannu. These days, on February 14, Valentines Day is celebrated in Bangladesh with great fanfare. The students and teen/ post teen generation as well as the older ones use their energy; ingenuity in doing thing to convince their loved ones. Exactly 25 years ago on the 14 the February, I was about to finish my high school in Dhaka. I had no clue what Valentine day was. Then during the rest of student life in colleges throughout the 80s, I still did not know or do much with Valentines Day. However 14th February remained a special day for us, the students and young people in the 80s. When the military establishment illegally captured state power on 24th March 1982, on this day, 14 the February the following year i.e. 1983, students lodged a large scale protest against the military occupation of governance. Five students – Zafar, Dipali Saha, Jainal, Mozammel and Ayub – were killed in the police firing, leading to the formation of Chhatra Sangram Parishad (students’ action council), the first politically organised platform against the military junta. The following year, on the same day during a student procession marking the event, the military rulers ran a truck on the peaceful procession instantly crushing Selim and Delwar to death. Over the next six years, many more lives were lost. We invoked the names of Dipali Shaha, Mozamel, Selim, Delwar millions of times. Students were followed by trade unions followed by professionals and they gloriously defied the military rule. Politicians joined hands and later the civil service stepped in. Military had no options but to surrender and retreat back to the cantonment. With restoration of democracy, along with many other things, we also forgot those who shed their lives for the democracy. And we badly mangled up militarycracy with a person Ershad. 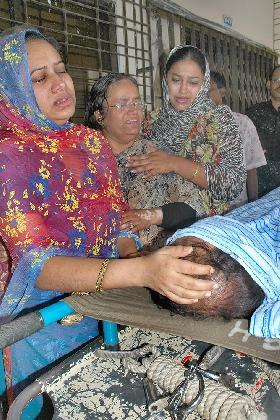 Ten years after fall of Ershad, he came back with a significantly limited capacity of a small political party leader. This time his power was not the military establishment. Ironically the people of his region were his principle force. It is not clear whether it was done intentionally or mistakenly; Ershad’s minimal importance in Bangladesh politics was blown out of proportion and was shown as the ultimate failure of the revolution of December 1990 and of democracy. Those cliques, who have been vocal in making the story of Ershad’s joining of different political fronts as the major blunder of Bangladesh democracy and ultimate reversal of 1990 revolution, did intentionally hide the facts that Ershad in 2007 represented regional people power, not the military establishment. And when the ideological difference is minor, changing sides is not so unusual in democracy. Not too long after media uproar over Ershad drama, stage was set for full blown military takeover and on 1/11/2007, military establishment regained crown they lost on December 1990. In 1982, the facade was Ershad, this time it was Fakhruddin and a bunch of retired bureaucrats and technocrats. Unlike last military establishment, this new generation of military establishment is much smarter. This time the word martial law has never been pronounced, although the country faced worst kind of steam roller since its inception. This time no single character was allowed to turn into a villain. The main facade Fakhruddin worked hard to keep showing his political and administrative impotence; once a while if some advisor got out of control they have been instantly kicked out. And unlike 1982, this new generation won’t bother shooting at students. They will rather assassinate the mind, not the body. This government has excelled in picking up top tier political leaders, businessmen, intellectuals, teachers, students, journalists—torture them to inflict the worst possible emotional trauma and physical pain. And during this 14 th February, nobody will recall Zafar, Ayub, Selim and others. Thanks to media promotion, young people and students will wear special dresses, draw graffiti on the face and celebrate beginning of Falgun or Poush or the Valentines Day. Although certain entity in Bangladesh think themselves as the great upholders of our historical accuracy and glory, history of peoples’ war against military establishment in 80s did never gain the elite status like that of 71 or 52 history. And surely some very strong quarter do not want our young generation to know about the sacrifices of these seven or those 24 in Chittagong or Zehad or Nur Hossain or Milon or many more. And probably that’s why Channel I etc will rather observe Pohela Falgun or Valentine day than remember Shahid Selim, delwar, Dipali Shaha, Zafar, Mozammel, Ayub or Joynal. The free judiciary and the clean police. Oh Yes. You tell me. This 1/11 has done two great things. It has separated the judiciary to make it independent and honest and it has cleaned the police under the leadership of the Dilip Kumar look alike IGP. Dhaka, Feb 7 (bdnews24.com) – The police Thursday arrested former prime minister Khaleda Zia’s adviser ASM Hannan Shah at the gate of Narayanganj jail, shortly after he was freed on bail. Fatullah police arrested him on charges of violating emergency rules and took him to the court of additional chief judicial magistrate Golam Mahbub. The court ordered him to jail. Sub-inspector Bhuiyan Mahbub Hasan, who filed a case against him with Fatullah Police Station Thursday, told the court that Hannan Shah had held a rally with about 200 party workers near the jail gate soon after his release from prison. The police alleged that the rally breached emergency rule. “The rally spread panic among people and halted traffic on the road past Narayanganj jail,” the SI said. In court, Hannan Shah denied joining any rally and said the case filed against him was false. Hannan Shah was earlier arrested on Nov 7 for his alleged links to violence near former president Ziaur Rahman’s grave in Sher-e-Bangla Nagar on National Revolution and Solidarity Day. On Jan 30, the High Court declared illegal his detention and granted him bail.